One of the amazing plant-based protein sources I read up was Cauliflower. Strange as it seems, 1 cup of cauliflower has 2 grams of protein (or 1 large head upto 16 gms!). While I am no nutrionist to certify or check this, adding proteins into our vegan / vegetarian diet seems much easier with Cauliflower. And with its cousin Broccoli being a favourite, I am sure these two veggies would find more avatars at home in new dishes such as today's yummy and hearty soup ! As we step into the 3rd week of this Proteinicious Mega Blogging Marathon, we continue with more appetisers especially those for kids and party nights. Vegans - can substitute the cheddar with any vegan cheese like Cheezly or Tofutti or any you can easily make at home (Cashew butter brie or mozarella). In a pressure pan, add oil. Saute onions, cauliflower fr 2 mins, Add the veg stock. Pressure cook for 2 whistles (if you don't have a pressure cooker, boil till the cauliflower turns really tender). Cool and puree (don't strain). In a soup pot, add the puree, a little more water, salt and spices and bring to a gentle simmer (about 3-4 mins). Switch off , Add grated cheese and stir in gently till you get a slightly thickish consistency. 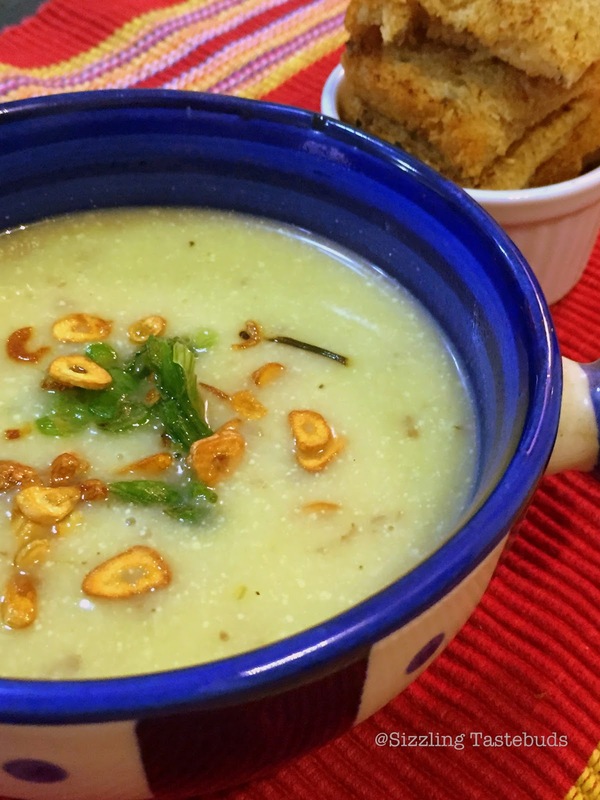 The soup looks very creamy and that garlic on top is to die for ! We have this burnt garlic tempering in most Sindhi dishes . Perfect choice for a Protein Rich Soup . Burnt garlic is my favorite. The soup looks so rich and delicious with the burnt garlic on top. Cauliflower ,Cheddar and garlic really makes an awesome and hearty soup. That is such a tempting soup...cheese and garlic would be a fabulous combination with cauliflower! I owe a lot of my interest to Masterchef Australia too! 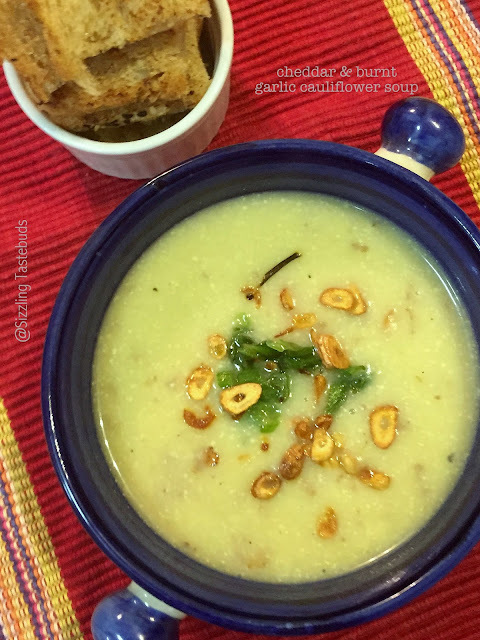 Omg, wow, cheddar and burnt garlic cauliflower soup looks ultimate, irresistible bowl there. We too love our soups Kalyani. My cauliflower soup is lined up for this theme :0 Love yours cheddar and garlic on top..yummy. Such a creamy and delicious soup. I love those burnt garlic slices on top. It sure makes the soup so full of flavour. Beautiful soup. I am sure I can make the burnt garlic for hubby. He will go Gaga over it. Such a flavorful soup. I am trying to picture the flavor. I love garlic and burnt garlic sounds so delish. The last pic looks so inviting Kalyani.